If you’ve been watching or listening to the uprisings in Egypt, Libya, Bahrain and Yemen, you’ve likely heard an Arabic interpreter. They’re everywhere. And they can have different takes on the same message. Libyan Leader Moammar Gadhafi’s recent “angry and rambling” speech did sound rather angry on Libyan state TV, but downright tepid via the CNN interpreter. Then there was Egyptian Vice-President Omar Suleiman’s now famous announcement that President Hosni Mubarak would be stepping down. The Egyptian state television interpreter said Mubarak had decided to waive the office of the president, rather than relinquish, as others translated it. Meanwhile, the CNN interpreter said the country would be run by the higher council of the armed forces rather than the Supreme Council, its proper name. What’s more, the CNN interpreter repeated the president’s name three times, so caught up in his own excitement that he forgot the rule about trying to mirror the speaker’s emotions. Nit picking? Maybe. But don’t get me wrong. Simultaneous interpreters have an astonishing ability to process the words streaming into their ears in one language and instantly spew them out in another — but this highlights an interesting problem. 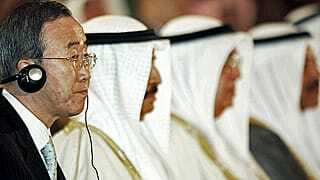 As the Arab world’s prominence in global affairs rises, so too does the need for Arabic interpreters. And while interpreters hired by the news media may be very fine, they’re often not professionals, and experts say there may well be a need for quality control to ensure accuracy in message and tone. So I turned to the pros to find out how it’s done. At the UN, interpreters learn to do two things no matter how intense the pressure: to faithfully render the message and, also, the emotion of the speaker. The UN’s Arabic section chief Rasha Ajalyaqeen says interpreters adhere to the idea that a word is like a bullet: once it’s out, it cannot be retrieved or replaced. Ajalyaqeen has worked for 27 years as an interpreter and says her heart still pounds going into the General Assembly or the Security Council. Her job is not only to be quick and accurate but to be on top of the issues. From the moment she clicks on the news in the morning, her brain starts storing information she might need during the day. The last thing an interpreter wants is to be caught speechless. But sometimes a delegate can quote from an unknown or unseen document. A good interpreter can move seamlessly between the syntax of Arabic and English, which is tricky because they’re so different. Ajalyaqeen says preposition placement is important and so is verb, noun and adjective collocation — the first thing to go, she says, when you’re under stress. Sentences in Arabic are also extremely long, so they need to be broken into more manageable components; Ajalyaqeen stresses that while you need to follow the rhythm of a speaker, you also need to remember the audience. To faithfully render a speaker’s message, simultaneous interpreters need to be on their toes. That means an hour of rest after 30 consecutive minutes of work. Less than that and quality suffers. That rule was demonstrated in the fall of 2009 when Libya’s Gadhafi insisted on bringing his own interpreter to the General Assembly. About 75 minutes into a meandering speech, observers noticed the interpreter was getting more and more stressed, and the interpretation was suffering. Ajalyaqeen heard it and sprinted the two blocks to the General Assembly to interpret the final 20 minutes of the speech. Talk about being on your toes. The other element to good interpretation is accurately rendering the emotion of the speaker. That means that if someone is outraged, you need to be outraged. If that person is disappointed, same goes for you. If the speaker is passionately warning of dangerous civil unrest and you sound like a monotonic Tibetan monk, well, your credibility drops. 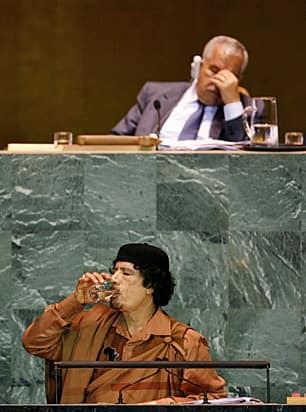 So if you’re translating for Gadhafi, you might need to bite your tongue. The potency of the message should override any subjectivity in the interpretation. Today, interpretation may be more important than ever. The number of items at the UN requiring interpretation has skyrocketed, and more delegates are speaking Arabic. Ajalyaqeen says that in the diplomatic world, it’s long been a matter of pride for delegates to speak other languages. But now, using one’s own language has that cachet. More often than not, Arab delegates know a second or third language, but choose to speak Arabic, confident that their message will not be compromised. Obviously, much of what interpreters at the UN deal with doesn’t affect those interpreters who work only in broadcasting. But the principles of staying true to content and tone remain the same. As the number of issues affecting the Arab world increases, as activists try to use Egypt’s success to pull the rug out from long-sitting autocrats in the Middle East, and as satellite media expands, we’ll be hearing more and more interpretation. Already, the voices of the interpreters on Al Jazeera are quite recognizable. Mind you, it remains to be seen whether media interpreters, like those at the UN, can manage to stay invisible.